Over Bed/Chair Table With Large Tilting Section. 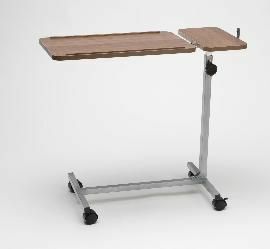 This overbed/chair table has a large tilting section and a small fixed section which can be for items that need to be kept level e.g. drinks and food - Can be fitted for right or left hand use. The wood effect, laminated tabletop has an edging strip at the front and the back of the tilting section to prevent items falling off. Easily height adjustable with a single clamp between 711mm and 1118mm (28” and 44"). It can be tilted either way to 45° using a single contoured knob. Supplied flat packed for ease of storage and is simple to assemble. 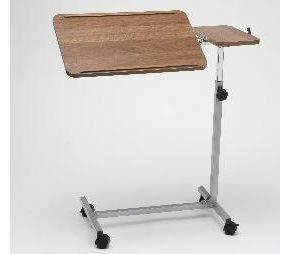 I am very happy with this table, good solid construction and handy to have dual action table tops.